Bodi laminating rollers are strong, long-life rollers made with thin fins and deep grooves provide excellent air release. Patented handle design proven least tiring during long hours of use. Also accepts extension handles for hard to reach jobs. Non-corrosive 1/4" frame. Aluminum or plastic frames clean easily in solvent. Excellent for laminating applications. BOD-11-33A STANDARD ROLLER ALUMINUM 5/8 X 3"
BOD-11-36A STANDARD ROLLER ALUMINUM 5/8X6 IN. 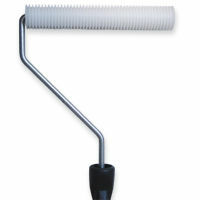 BOD-11-43A STANDARD ROLLER ALUMINUM 3/4X3 IN. BOD-11-46A STANDARD ROLLER ALUMINUM 3/4X6 IN. BOD-11-53A STANDARD ROLLER ALUMINUM 1" X 3"
BOD-11-56A STANDARD ROLLER ALUMINUM 1" X 6"
BOD-11-46P STANDARD ROLLER PLASTIC 3/4 X 6 IN. BOD-11-56P STANDARD ROLLER PLASTIC 1 X 6"
I should have purchased one of these with my first order of fiberglass resin. Presses the fiberglass down much better than I've been able to do with a brush.Also, this roller is able to push the glass into a radiused corner easily. Wish I had bought one of these much sooner. May buy one or more of other diameters. I should have bought this when I first started working with fiberglass about a year ago. It really pushes the fiberglass down better than a scraper or brush. Cleans up easy too.